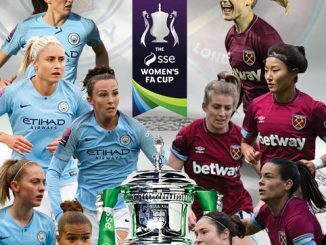 Only Aston Villa claimed a home point in the FA Women’s Championship but Millwall Lionesses were just moments from denying leaders Tottenham Hotspur their expected victory. Tottenham Hotspur extended their lead at the top to four points but had to overcome a much more resilient Millwall side than the one they thrashed 8-0 earlier in the season. 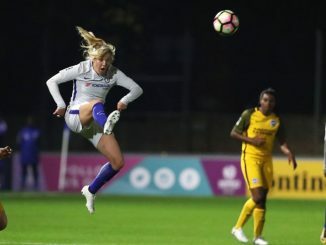 Megan Wynne crossed for Sarah Wiltshire to sends a looping volley into the hosts’ net on 35 minutes but Evie Clarke equalised a minute from the interval, running in behind the Spurs back-line to shoot past Chloe Morgan. 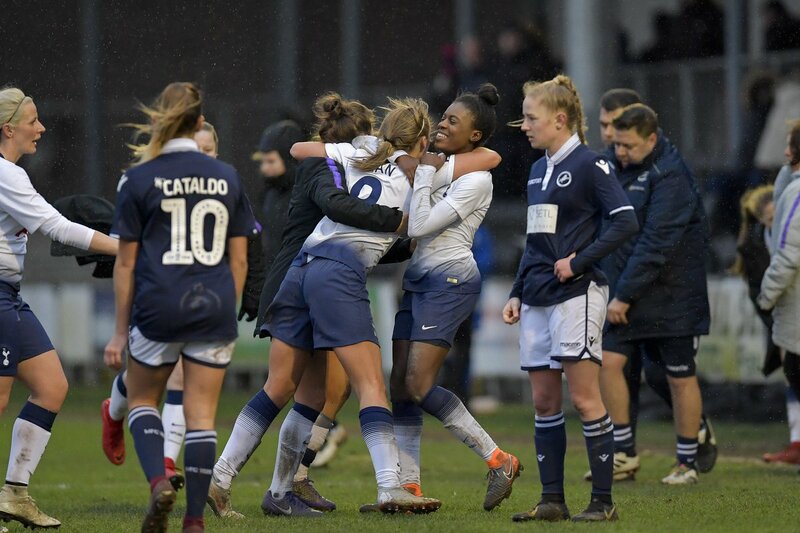 Jenna Schillaci’s corner to the front post saw Emma Beckett head home her first goal for Spurs and even though Beth Lumsden levelled late on for the Lionesses, Rianna Dean netted a dramatic 95th-minute winner for Tottenham. Charlton Athletic returned from Sheffield United 3-2 winners to go second in the league. Kit Graham nodded the Addicks ahead and was very close to a second when rounding the keeper but couldn’t find the target on this occasion. 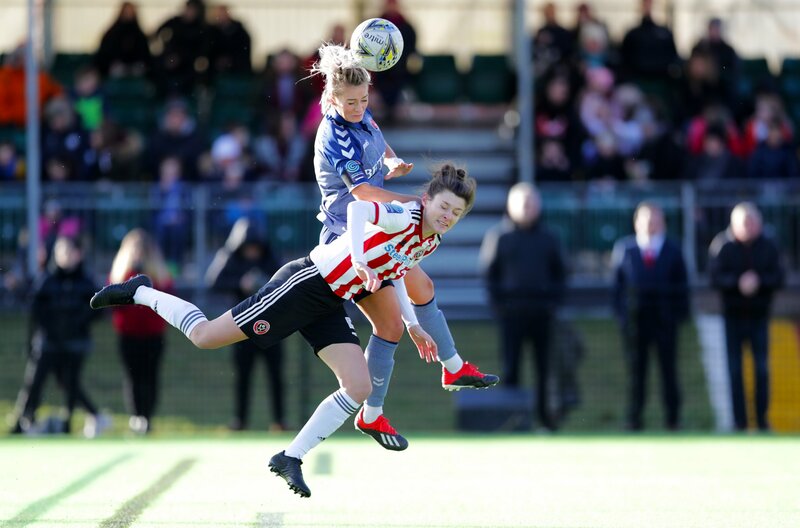 Lily Agg did get the visitors’ second goal but on 64 minutes Veatriki Sarri’s corner was turned in by Danielle Cox to give the Blades hope. Charley Clifford buried a 35-yard free kick to make it 3-1 and Ebony Salmon pulled one back with her first goal for Carla Ward’s side. Durham were 2-0 winners away to Crystal Palace, where they struck early in either half to move third in the Championship. The Wildcats took advantage as Lucy Gillett spilled a Rachel Lee free kick and Emily Roberts fired home 4 minutes into the match. Kallie Balfour saw her chance stopped by Hannah Reid and although Nicki Gears turned in Beth Hepple’s set-piece, the effort was ruled out. Gears did register 5 minutes into the second half, with a lofted effort from a through ball. Aston Villa and Leicester City finished goalless at Villa Park, with the Foxes having an effort ruled out for offside. Becky Hassall put a good chance for Villa wide, while Sophie Domingo went close for Leicester before the break. A Kerri Welsh cross skimmed the City woodwork and she was later denied by Demi Lambourne, who also saved acrobatically from Jodie Hutton. 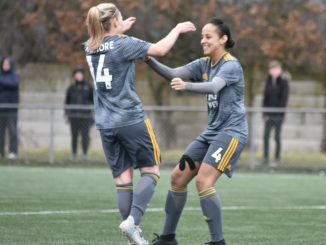 Domingo’s header into the net on 78 minutes was disallowed and Alison Hall dragged an effort wide at the other end as the game finished 0-0. 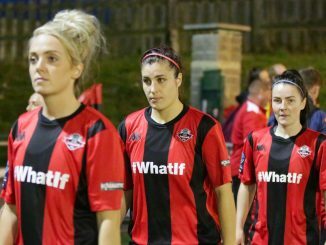 London Bees took the points at Lewes with two goals in the space of three second-half minutes, the win lifting them to fifth in the table. Trish Gould got through for the Bees in the first minute but was thwarted by keeper Faye Baker, while also early in the match, the Rookettes hit the bar through Sophie Perry. Brooke Nunn broke the deadlock on 64 minutes, getting in behind the home defence to lob the keeper. Three minutes later and it was 2-0, Destiney Toussaint’s cross leading to a goal-mouth scramble and a tap-in for Ruseha Littlejohn.